Applications for the Production Finance Market (PFM) New Talent Strand are closed. 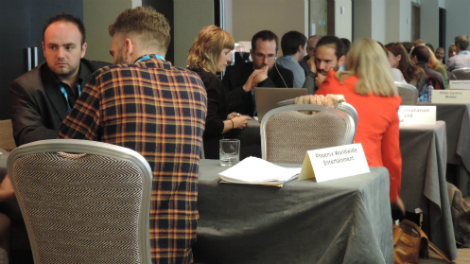 The Production Finance Market's New Talent Strand offers international financiers the chance to connect with a curated selection of the most promising emerging feature filmmakers from the UK and abroad. Formerly known as Micro Market, the New Talent strand has evolved in order to amplify its reputation as a critical opportunity for the industry to discover new talent. Showcasing filmmakers making their first or second feature, with projects budgeted up to €1m, the event also includes a training element for selected filmmakers to ensure they are ready to find finance and grow their networks within one of the world's most unique and respected markets. Is the PFM New Talent Strand for you? The New Talent Strand is for filmmaker teams with a fully-scripted first or second feature ready to be financed and a production budget of under €1m. Projects that are looking for completion money to deliver their film are also considered. These projects must be budgeted at €1m or under, and be seeking no more than 20% of their production budget for completion. New Talent Strand filmmakers are given specialised training, followed by the opportunity to pitch and discuss their projects with financiers, investment funds, sales companies, distributors, post houses, online platforms and public agencies at PFM. On the Market day, the filmmaking teams present their projects to the financiers in a day-long series of intense 30-minute meetings. Teams will have up to 12 meetings during the day. New Talent Strand film teams will also have the opportunity to network with financiers and participants from the main PFM in our general events during the market. Training normally takes place in London in late September (date tbc). Film makers based outside the UK are not expected to attend but will be able to access other support from the Film London New Talent Strand team. The day before the market meetings, all filmmakers will re-present their projects to their peer group to gather feedback and finesse their pitches whilst also attending special case studies and panel events. A networking evening with all PFM delegates is scheduled the night before the market day. Please contact pfm@filmlondon.org.uk for more information. The Micro Market is a really valuable opportunity to showcase work and opportunities to do this at this level are extremely scarce. So, having a shop window is critical. To be able to see ten execs at once is an incredible opportunity for a new producer and as there are less homes for this kind of material, there needs to be greater visibility than ever." "The incredible pool of talent working in the micro to small budget space is all too easily overlooked, but it is in this space that you often find the next big thing." We managed to generate a great deal of interest and momentum throughout our time at the Micro Market, which then led us going into production within six months." What the Market does, is It makes you really focus on the pitch and the strategy over the two days and the outcomes of that are extremely positive.. the training I received on this programme was invaluable in terms of my progression as a producer"